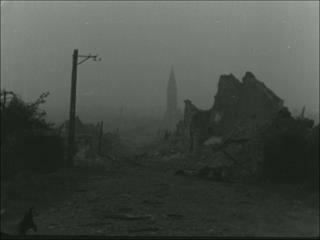 Units of the 7th Armoured Division enter the devastated village of Aunay-sur-Odon from the north-west and set about clearing the streets of debris and German booby-traps. 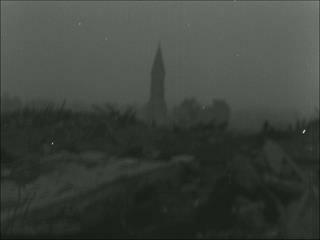 Among all the towns and villages of Normandy badly damaged in the fighting since D-Day, Aunay-sur-Odon is unique for the only structure still standing at its centre is a church steeple; Mont Pincon looms ominously in the background to the south. A Daimler armoured car belonging to the 11th Hussars is unable to make much progress through the bomb-craters and the heaped-up rubble; two crew members survey the desolate probe fields adjacent to a road leading into the stricken village for mines while their comrades keep watch from a Morris II light recce. car. A bulldozer starts to clear a path for military traffic. A bent road sign points the way to Thury-Harcourt and Falaise, two towns that will undergo a similar ordeal to that of Aunay in the next few weeks.